As per this image, 38 players answered the invitation on the first day of the National Team tryouts. However, not all of them participated in the drills and scrimmages. We break down the list of aspirants based on the team they are trying out for. Most of those who represented the country during the 2018 Asian Games and AVC Cup for Women were there. 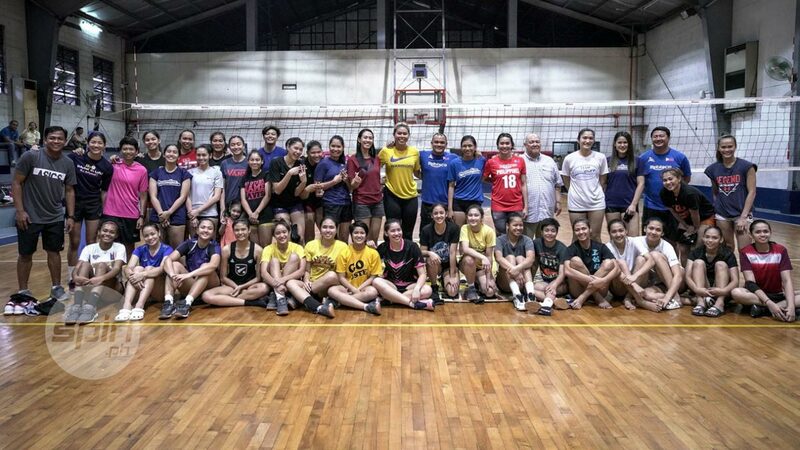 Alyssa Valdez and team captain Aby Marano joined the scrimmages that were facilitated by coaches Shaq delos Santos, Kung Fu Reyes, and Brian Esquivel. Also present at the Arellano University School of Law Gymnasium are Mika Reyes, Mylene Paat, Majoy Baron, Dawn Macandili, Denden Lazaro, and Risa Sato. Jema Galanza also went through the try-out but she is being geared for the Under-23 roster. Kim Kianna Dy and Kim Fajardo of the F2 Logistics Cargo Movers were in attendance but did not play because of the respective injuries. Aiza Maizo-Pontillas and Ces Molina of the Petron Blaze Spikers were also sidelined due to the same reason. Cha Cruz-Behag was there but did not join the scrimmages. New attendees include Jerrili Malabanan of the FEU Lady Tamaraws, Jannine Navarro of the Cignal HD Spikers, Ria Meneses of the Generika Ayala Lifesavers, Remy Palma of the Petron Blaze Spikers, and Kalei Mau of the Cocolife Asset Managers. It seems like a pool for an Under-19 team can be pulled out from the Under-23 aspirants. But until the coaching staff or LVPI officials decide to create another team, they will remain at the training pool for the U23. Aside from Galanza, included in the list are liberos Kath Arado, Kyla Atienza, and Buding Duremdes. UAAP girls volleyball is also represented by UAAP Season 81 Finals MVP Justine Jazareno of De La Salle Zobel and Season’s Best Libero Bernadett Pepito of UST. Wing spikers are also aplenty with UST’s Eya Laure, UE’s Mary Ann Mendrez and Judith Abil, and the De La Salle Zobel duo of Season 81 MVP Angel Anne Canino and 2nd Best Outside Spiker Alleiah Malaluan. The U23 pool won’t have a shortage of middle blockers with Celine Domingo, UAAP Season 81 girls volleyball 2nd Best Middle Blocker Alexis Ciara Miner, and FEU-Diliman’s Lyann De Guzman. Middle blockers Imee Hernandez and Janna Torres from UST juniors as well as Camille Victoria also joined the aspirants. Meanwhile, there were only two setters in the Under-23 pool: FEU’s Angel Cayuna and UST High School’s Tanya Narciso. The second day of tryouts is slated on January 25 at the same venue.